The Last Rose Of Summer "harp solo"
Pay Pal payment is acceptable. Cash payment by mail is also acceptable. please send your email or fax to CD shop,Tambourine. Irish harp player. Sayaka started to play the harp at the age of eleven and Irish dancing at thirteen. She learned both by herself. Since twelve years of age, visited various music festivals in Europe and North America every summer with her father, manager of a folk music CD shop. During those days she had short-term private lessons from harp players she adored such as Philip Boulding of Magical Strings(USA),William Jackson of Ossian(Scotland),Patsy Seddon of Sileas(Scotland) and Laoise Kelly(Ireland). Stayed in Ireland from 2000 to 2002. Learned basic and overall techniques and especially expressive performances in playing the Irish harp from Kathleen Loughnane in Galway, Ireland during this period. Also, she attended musical workshop at Edinburgh Harp Festival, an annual event held in Edinburgh and other workshops of Irish Harp Summer School annually held at Termonfeckin in County Louth, Ireland. 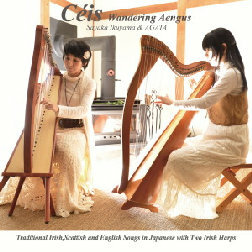 Sayaka teaches playing the Irish harp in 3 places in Japan. Supervisor of theatrical performance unit,Project UZU,actress,dramatist,producer of the drama,singer&songwriter and harp player. attention to the great songs from these traditions. these songs to a new audience and a deeper experience. A Japanese female Celtic harp duo made up of Sayaka Ikuyama and AGATA. oriental charm and vocal naivete works well.